We invite you to explore India - the Land with infinite beauty ! Whether you soar high into Himalayas or peer under the ruins of the Ancient monuments dotting the landscape of India, you will cherish the experience long after your visit ! This India Travel Guide on Chikmagalur Trekking is free from any commercial interest! This site is dedicated to promote India - the vast subcontinent, its glorious past, magnificent landscape and its infinite variety. Popularly known as coffee capital of Karnataka, Chikmagalur is a small town tucked away in the beautiful Baba Budan hill range on the Western Ghats. Chikmagalur is located at the southwestern part of Karnataka. Nestled in lush green surroundings, Chikmagalur has glorious temples, awesome peaks, soothing waterfalls, wildlife and dotted by rivers like Bhadra, Hemavathi, Tunga and Netravathi. This place is a feast for the senses and could be a perfect weekend getaway where all the tourist spots are within a couple of hours drive from the main town. The origin of the name Chikmagalur has an interesting tale attached to it. Chikmagalur literally means 'the town of younger daughter' and history reveals that this town was given as dowry (Part of the traditional Indian practice of offering some largesse to the bride) to the younger daughter of Rukmangada, chieftain of a place called Sakrepatna, hence the name Chikmagalur. Chikmagalur located at a height of about 1000 m (3100 ft) above sea level in the Western Ghat - is one of the many hill stations dotting the landscape of Karnataka, north of Hassan. There is a beautiful hill station called as Kemmangundi about 55 km from Chikmagalur. It is situated in the Baba Budan range of hills at a height of 1434 meters above sea level. Charmed by the serene surroundings and picturesque location Krishnaraja Wodeyar IV of Mysore made this place a summer resort and eventually handed it over to the state government of Karnataka. Hence it is also known as Krishnarajendra Hill Station or K.R. Hills. If there is one place that should not be missed by visitors, it is a spectacular rose garden maintained by horticulture department of Kemmangundi. This place is surrounded by enchanting mountains and watching the sunset from some of the peaks will leave you with a blissful experience. From Kemmangundi, you just have to travel 10 km further and you will reach the heavenly Kallathigiri waterfalls. The gushing sound of the water falling on to the rocks is sure to mesmerize the visitors. Visit Veerabhadraswamy temple situated near the waterfalls, a temple dedicated to the Hindu God Shiva. Baba Budan Giri range, located 20km north to the Chikmagalur is a mountain towering 1895m high. The unique feature of this hill is that it has a pilgrimage center called Inam Dattatreya Peetha where both Muslim Sufi saint Baba Budan and Hindu God Guru Dattatreya are worshipped at the same place. This place is revered by both the communities equally. In these ranges, Muslim Saint Baba Budan cultivated coffee for the first time after bringing the seeds from Yemen and hence these mountain ranges are named after him. A Manikyadhara waterfall near Baba Budan Giri Dattatreya Peetha is a 'must visit' place where water flow is more gentle and soothing. 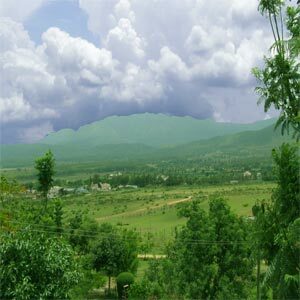 The range has one of the highest mountain peaks called Mullayangiri with a height of 1930 m (6317 ft.), which ranks next to the Nilgiris in height. It is the tallest peak in Karnataka and this peak provides a breathtaking view of the Arabian Sea. Built in the Hoyasala and Dravidian style of architecture, Kodanda Ramaswamy Temple dedicated to the Hindu God Rama, in Chikmagalur is a popular place of worship and visited by the devotees throughout the year. You can see the annual jathra festival if you visit around February - March. Do not miss the shell shaped portico at the St. Joseph's Cathedral. Rathnagiri Bore, a tiny hillock in the town of Chikmagalur is a popular tourist spot because of the panoramic view it offers of the Mullayanagiri peak. A beautiful park has been developed here to attract visitors and is named as Mahatama Gandhi Park. Bhadra wildlife Sanctuary is situated about 38 km from Chikmagalur main town and is known for its large tiger population. Set in an area of 500 km, this wild life sanctuary is home to different species of animals and birds. State government of Karnataka has set up a resort called Rivertern lodge within the sanctuary region and those who love the challenges of forest can avail the safari rides offered by the resort. Chikmagalur offers wide range of resorts, hotels and home stays to suit all budgets. Most of these facilities are set amidst beautiful coffee plantations at the backdrop of high mountains and lush green forests. The Serai, Kalgreen Valley Resort, Taj Garden Retreat, Tex Woods, Winter Greens, Silent Valley Resort are some of the renowned resorts that attract tourists to enjoy the beauty of Chikmagalur. Air: The nearest airports are Mangalore (180kms) and Bangalore (275kms). From here you can take a taxi to Chikmagalur. Rail: The nearest railway station is Kadur, which is situated 40kms away from Chikmagalur main town. Road: Frequent buses ply from Bangalore to Chikmagalur; alternatively you can hire a cab to reach the place.